I'm Having a Birthday and 200th+Post Giveway....So Let's Party!!!!! My Birthday is this coming Monday the August 8th. and along with my Birthday Celebration I wanted to celebrate my 214th posts with all of You as well!!! I wanted to "Thank All of You" for following me and becoming such Wonderful Friends to me. All of you are so talented and such sweethearts that I wanted to give something back to You!. Ha ha I just noticed...the thin black thing to the left of the picture is my sunglasses...sorry...it's too hot to go back outside to take the pictures over again...hope you will forgive me?? 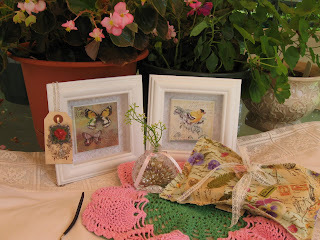 So I am giving you two lovely little pictures that I actually bought last year for one of my Giveaway's and always forgot them ...sooo here they are and they are soooo sweet for your bedroom or bathroom, well I'm sure you will find a great place for them!!! I have also made for you a Sweet Rose necklace...can you see it hanging to the left on the picture.....it sooo sweet, like You are to me!! !